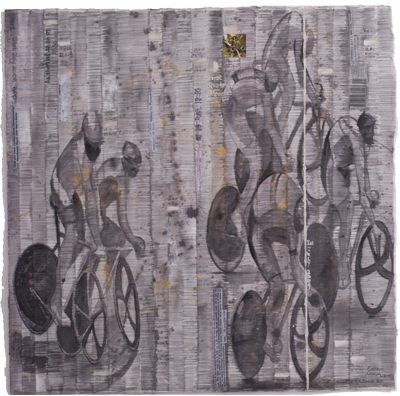 The following two Cycling watercolour drawings are based around the 2012 London Olympics. 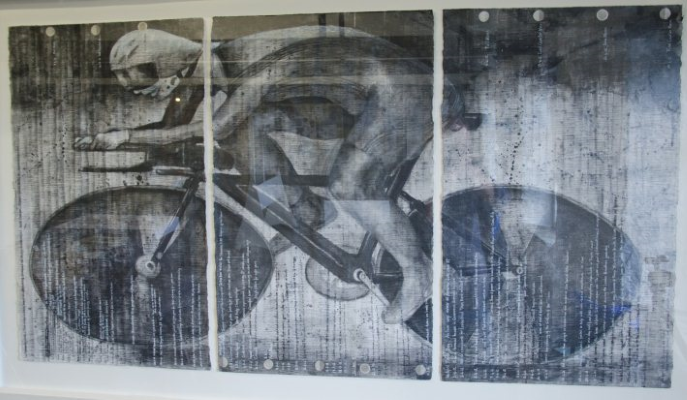 Local Hero is a sequential drawing in soluble graphite of the cyclist Wendy Houvenaghel. During its production, unfolding local B.B.C. news headlines were added across the surface . Watercolour: 75 x 140 cm. Gale Warning is a sequential watercolour drawing, with local gale warnings listed across the surface. Watercolour 100 x 66 cm. The following two water colour drawings of cyclists were derived from photo finish images acquired at the Manchester Velodrome, where I witnessed both events. The drawings were completed much later during the Summer of 2009. They both marked a return to the idea of the photo finish image as resource material. The image is transposed little by little on a daily basis, in the same manner as the Chronicles. Ephemera act to register time along with diary entries added as the drawings progress. Moon phases and The Summer Solstice are also recorded, as are times of working and small personal details. 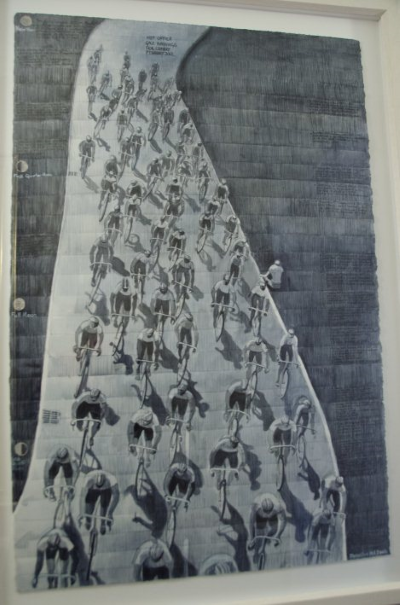 ‘The Trip’ was created at the UCI World Championships in March 2008: Watercolour 45 x 37 cm. 'Collision' was created at a UCI World Track Cup on the 1st November 2008: Watercolour 56 x 56 cm. The latter more spectacular scene was the mens sprint between Jason Kenny and Shane Perkins. Following the same idea as above the following two drawings emerged. Both images experiment with temporal issues and are derived from the idea of the photo finish image. They also mark a highly disruptive and difficult period of time within my community. The medium of both images is soluble graphite. 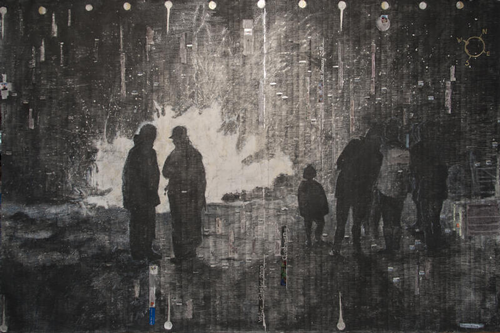 ‘The Beacon’ 2010 Soluble Graphite 103 x 152 cm, is a drawing based upon a photograph of a beacon lit at Trevalga, on 21st October 2010. It was achieved over a period of three Winter months in the same way as the previous chronicles, thus embedded within the surface are contemporaneous ephemera and diary entries. 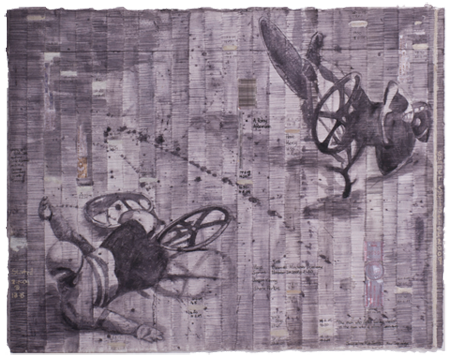 ‘Endangered Species’ 2010 Soluble Graphite 57 x 76 cm,the smaller drawing of the two, was completed in the same way. 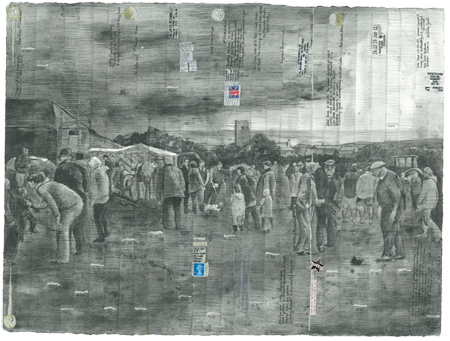 It depicts the annual village fete in July 2010. © Jacqueline M. A. Jarvis 2011-2017.